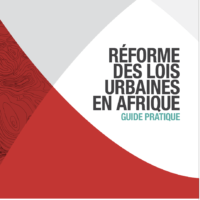 Reforming Urban Laws in Africa: a practical guide by ACC Adjunct Professor Stephen Berrisford and the late Patrick McAuslan, which was awarded the Dubai International Award for Best Practices (DIABP) in the category University Research Award on Legislation, Rules, Regulations & Governance Systems earlier this year, is now available in French. The Guide is intended to provide practical advice to officials and consultants working on urban legal reform on how to manage law reform processes in a way that is more likely to produce effective results, drawing on the co-authors’ practical experience and many years of experience in urban legal reform in the region. Watch the Reforming Urban Laws in Africa video series here.